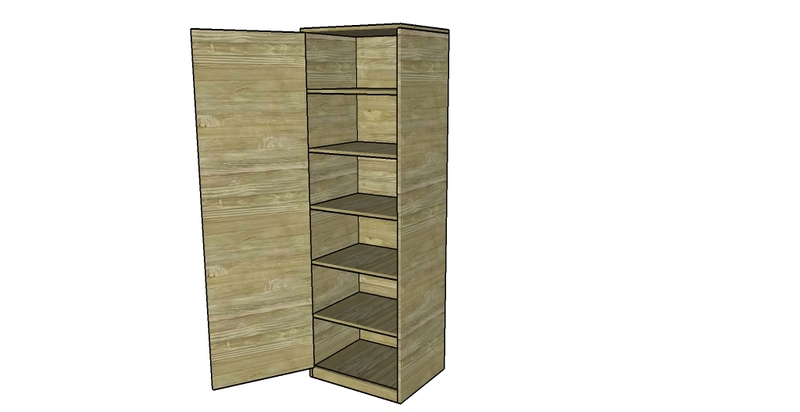 This step by step diy woodworking project is about closet storage plans. 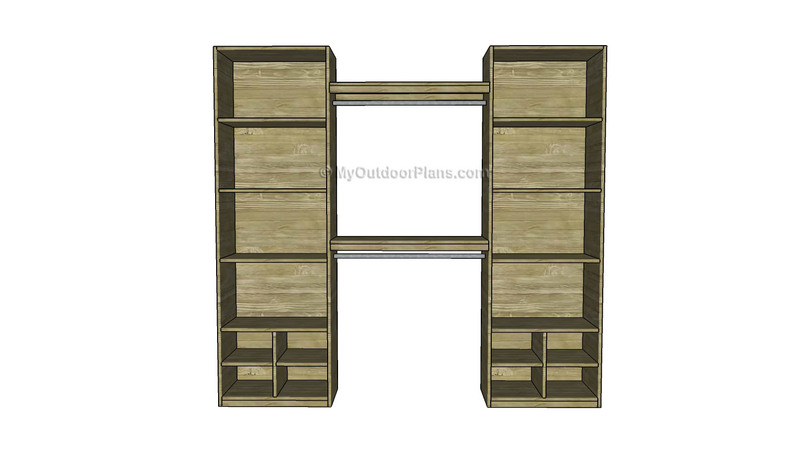 If you want to learn more about building a medium-sized closet organizer with a classy look, we recommend you to take a look over the instructions described in the article. Work with good judgement and don’t forget to take a look over the rest of the related plans, as there are many designs and woodworking projects to select from. 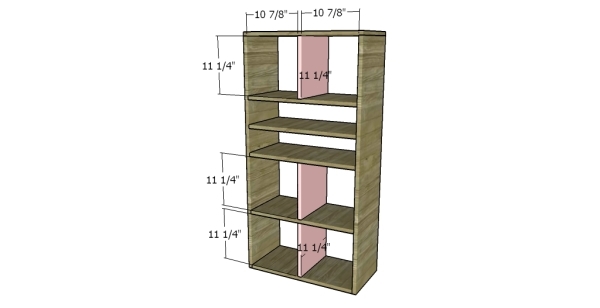 The first step is to build the frame of the closet organizer. 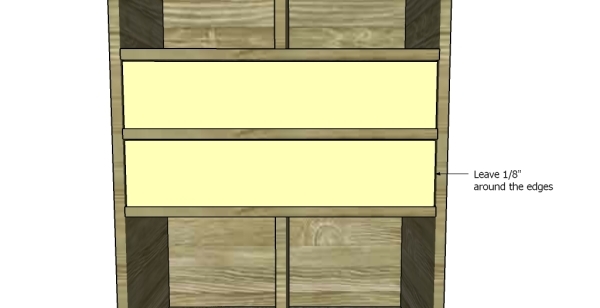 As you can easily notice in the diagram, we recommend you to build the components out of 1×12 lumber. Cut the components at the right size and smooth the edges. Drill pocket holes at both ends of the bottom component and at the top of the side components. Check if the corners are square before fitting the 1 1/4″ screws. Add glue to the joints. 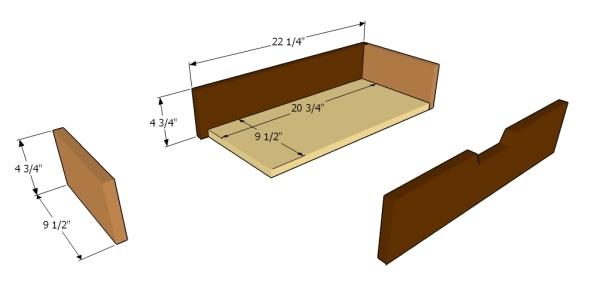 Continue the project by fitting the shelves and the partitions for the drawers. Drill pocket holes at both ends of the 1×12 components and fit them inside the frame. 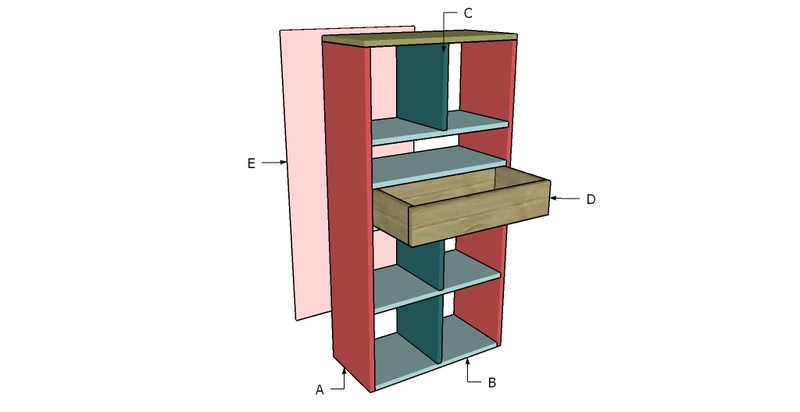 Use a spirit level to check if the shelves are horizontal and secure them to the frame using 1 1/4″ screws. Make sure the corners are square and add glue to the joints. The next step of the project is to fit the 1×12 partitions to the frame of the closet. Drill pocket holes at both ends of the partitions and center them to the structure. 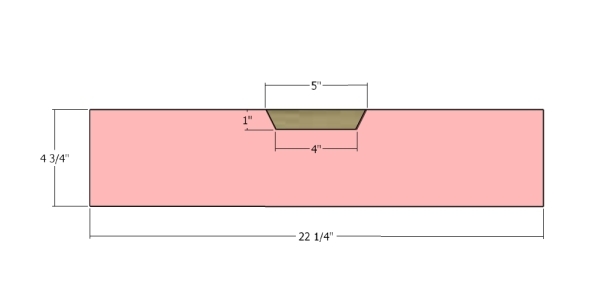 Make sure the corners are square and insert 1 1/4″ screws to create a rigid bond. 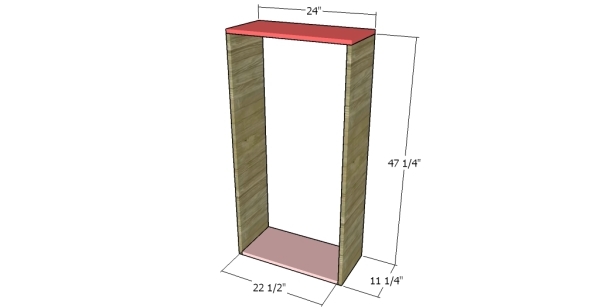 Continue the project is to attach the 1/4″ plywood back to the frame of the closet organizer. Cut the component at the right dimensions and secure it to the back using finishing nails. Make sure the corners are square before inserting the nails and add glue for a better bond. Building the drawers is a straight forward process. 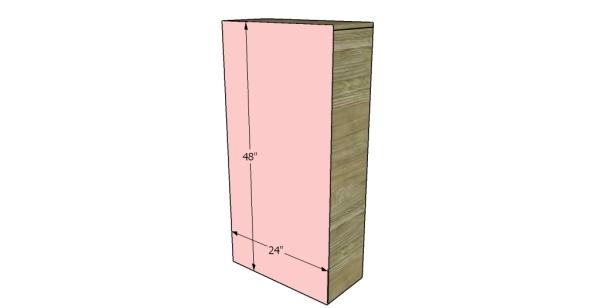 Build the components out of 3/4″ plywood and take accurate measurements for a professional result. Drill pocket holes at both ends of the side components and insert 1 1/4″ screws into the perpendicular slats. Drill pocket holes along the bottom of the drawer and secure it to the frame using 1 1/4″ screws. Add glue to the joints. 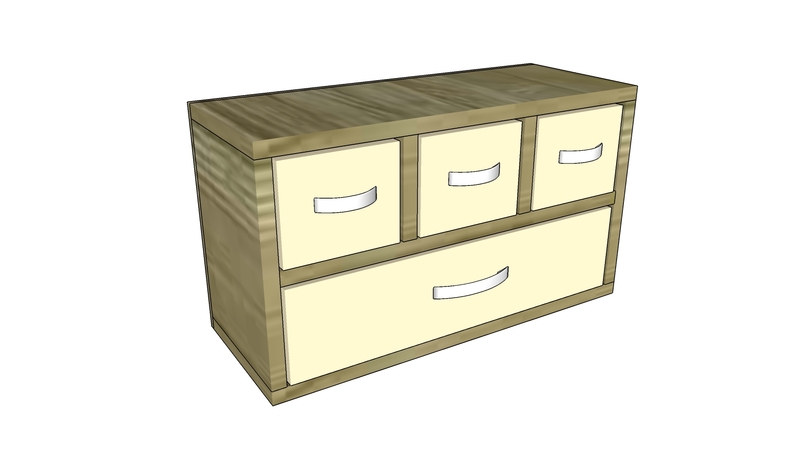 In order to open and close the drawers easily you can attach handles out cut out the front face, as in the diagram. Smooth the edges with attention and remove the residues with a damp cloth. Wax the bottom of the drawers and fit them inside the openings. 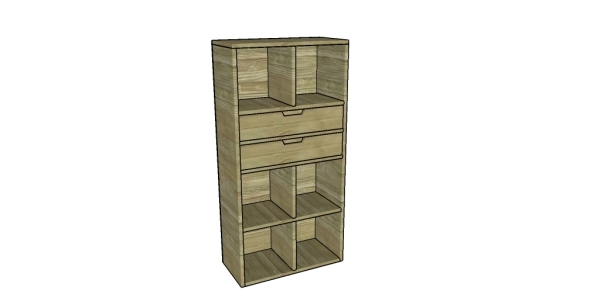 Make sure there is a 1/8″ gap around the drawers and align the faces with the frame of the closet organizer. Top Tip: If you want to enhance the look of the woodworking project and to protect the cabinet from decay, we recommend you to cover the components with paint or stain. Place the closet organizer in a proper location and move it whenever necessary. 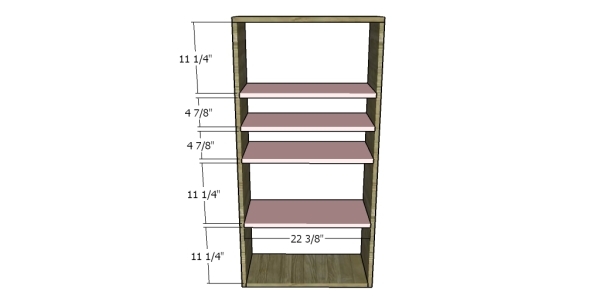 This woodworking project was about closet storage plans. If you want to see more outdoor plans, we recommend you to check out the rest of our step by step projects. LIKE us on Facebook and Google + to be the first that gets out latest projects and to hep us keep adding free woodworking plans for you.